The junior competition at the 2014 Secret U.S. Classic was incredibly exciting, especially compared to the no-surprises senior meet later that night. I think everyone expected all-around gold to go to one of the competitors in the senior session – namely to Nia Dennis or Norah Flatley, both of whom were successful members of this year’s Pacific Rim Championships team. Instead, Jordan Chiles – who competed in the junior session because only those age-eligible for the 2016 Olympic Games were allowed to compete with the seniors – put in a heck of a performance for the gold while Dennis took silver and Flatley shared bronze with 12-year-old Deanne Soza. If Chiles’ win was a surprise, it wasn’t shocking; she showed immense improvement between last summer and this spring, and was added to the junior national team in March when she earned a spot on the City of Jesolo Trophy team. She also had the added benefit of the problems Dennis and Flatley had on floor (Dennis sat her 1.5 through to double back while Flatley skidded out of bounds). She wouldn’t have won had Dennis not fallen, you say? Who cares? Dennis did fall and Chiles had a great day. It happens all the time. Gymnastics isn’t necessarily about who’s the “best” but rather who’s the best on that one particular day. Moving on, Soza’s bronze was something no one expected. She pulled in a medal thanks especially to her superb attention to execution, her unique but clean skills on bars, and her strong tumbling on floor. Also exciting is that three other young and mostly inexperienced juniors – Jazmyn Foberg, Maile O’Keefe, and Megan Skaggs – were all less than a point of Flatley and Soza’s score, making it one of the better U.S. all-around competitions in a long time. In addition to these competitors at the top, we have compiled some of our favorite moments, routines, and skills, in addition to what made us sad during the meet. Don’t worry, it’s mostly fun, and NO CRYING. Believe it or not, but not one of the top 30 all-around finishers fell on bars. I can’t get over this!? Everyone hit, hit, hit. Even if execution wasn’t the best, routines were still fantastic…like Alyona Shchennikova, for example. She got a bit of a dig in her execution score, but some form aside, she was hitting really lovely skills and I thought she showed a lot of potential. Some spectacular routines aside, we didn’t see a ton of super difficult connections or anything just yet but the individual skills are looking fantastic and again, the key word here is potential. We don’t need 12 and 13-year-olds ripping their shoulders out six years before they have a shot at the Olympics. What we do need are consistent, clean, and promising young bar workers, and that’s exactly what we showed we have. Ready for the numbers? You probably won’t believe it. 44 U.S. juniors competed on uneven bars at the U.S. Classic. SIX JUNIORS FELL. And two of these falls were on dismounts! It’s kind of a miracle. At junior qualification meets I sometimes expect to see at least half of them hit the mat at some point, but between the no falls and the overall attention to detail, this was a thrilling day for the future of Team USA’s bars. One of the coolest moments of the meet was seeing little Adriana Popp on beam. She split the beam on her bhs-bhs-layout series, and it looked like it hurt. But she didn’t fall. We see epic save attempts all the time on beam, but most don’t result in an actual save…but Adriana refused to let her feet touch the mat and spent several seconds fighting to pull herself back up without ever actually coming off the apparatus. STOP. DON’T GO ANY FURTHER! You absolutely must watch these routines. We’ve already compiled a list of what we thought were fifteen of the best routines from the junior session, but now we have some more favorites. They’re not necessarily the best-executed or the most difficult, but they truly stand out in a world of FTYs and full-in bars dismounts. This floor routine performed by Caitlin Smith is full of energy. There’s not much of a crowd there, but if there was, they’d be cheering along to this one. It’s hard to ignore the passion she has jolting through her body like electricity not only in her choreography but in every tiny movement she makes. She’s very sharp, and her execution is also fantastic! Abigail Matthews on bars is a DREAM. She’s so tall and her legs go on for miles. She has some form issues and flexes her feet on her pak, but that Endo half to toe full killed me. I would love if she could connect that to the Maloney. She’s an older junior and didn’t qualify to nationals so I don’t know how likely it is that we’ll see this in major elite competition in the future, but I could watch her lines for days. They’re also gorgeous on beam. 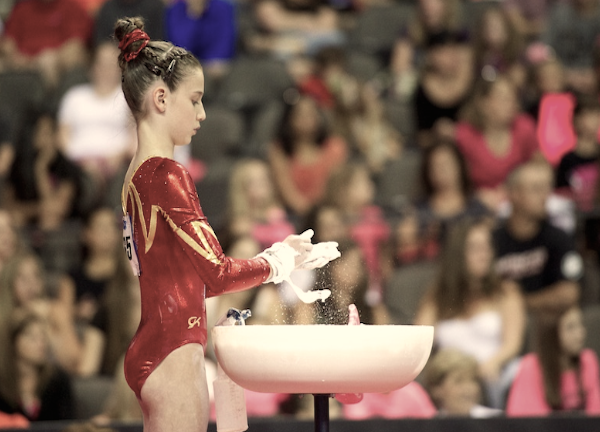 I go on and on about Christina Desiderio’s floor, but I think her beam might have been my favorite of hers this year!? Ignore the fall on her bhs=bhs-layout series. This routine is packed and could have huge potential. It’s SO CLEAN, her execution with a fall is actually on par with many of those who didn’t fall. That front aerial to scissone is heaven, as is her switch ring. I think if she hits, she could definitely make the medal podium at Nationals. Adriana Popp got a nod already for her ridiculously cool beam save, but she gets a double nod from us because her floor is pretty gorgeous and she opens with a double layout! Um, she’s twelve. Lexy Ramler was known for her Bhardwaj last year, but unfortunately it was always a bit messy and that’s what people were talking about. This year she’s cleaned it up and also looks fantastic doing a Comaneci salto as her release, an Endo half, and a full-out dismount, a welcome change from the sea of full-ins. Such a unique routine and great to see she’s getting better and better at it. At this meet, she also had what I considered one of the best FTYs. She will be fantastic in college – one of the cool kids always trying something new just to be different. Finally, Emily Gaskins’ beam. She didn’t have the best meet and this routine isn’t without its little shakes and wobbles but it’s also gorgeous and elegant as anything I’ve ever seen. She has so much style. In addition to the routines above, we also saw some awesome bits and pieces within routines. First off, four juniors did full-twisting double layout uneven bars dismounts – Deanne Soza, Rachael Flam, Aria Brusch, and Bailey Ferrer. I remember when a bunch of girls from the last quad finally added full twists into their double layouts at Olympic Trials, so it’s crazy that a whole group of kids is working more than the routine full-ins. We also saw an arabian double front bars dismount from Maile O’Keefe. Soza makes the list again for being skill twins with Victoria Nguyen on beam. Both of these ladies have two really gorgeous combinations in their routines – a front-front-side aerial and a switch leap to Onodi. Nguyen unfortunately got lost in her aerial series on Saturday, but typically does it beautifully, as does Soza…but the switch to Onodi combo was awesome. I can’t get over little McKenna Appleton doing Dominique Moceanu’s same exact beam mount to start off her routine. And she does it really well! I didn’t include Norah’s beam routine in any of my ‘favorites’ because come on, everyone knows what Norah can do. But when you watch her routine, watch it for her connections. With the exception of her switch ring and a random side aerial, every single skill in that beam is connected to another skill – even her turns! She competes a lovely full L turn to an immediate quick turn in passé. Just gorgeous and fluid and breathtaking. Mostly my tears. The kids all seemed to be okay. The worst part of the day was poor Anastasia Webb not getting a vault score because she took off before the flag went up. She finished her FTY and began saluting to the judges, who were throwing their arms up in the air and causing a general ruckus. Poor kid. She wasn’t going to qualify to U.S. Nationals anyway…couldn’t we have just given her the score so she doesn’t remember the first major elite meet of her life and think about how crappy it was because of that one mistake? I mean, you’re handing out pretend 0.1 stick bonuses, so why not overlook this poor girl’s unfortunate mishap? Speaking of mishaps, poor Olivia Trautman! She hit her Tkatchev on bars with her coach standing right behind her, ready to catch her if needed. Except she was too close, and her hands definitely touched Trautman’s bum. Trautman’s coach jerked her arms back to pretend like nothing happened, but oh, the judges definitely saw. They took off a full point for the touch from her coach, and then she also lost nearly a point in her D-score due to the Tkatchev no longer counting. I was probably more upset than Trautman or her coach. I think I need a sports therapist. That about wraps up our Secret U.S. Classic coverage for 2014! What was your favorite moment from the junior meet? We honestly loved watching everyone and don’t think there’s a abad apple in the bunch. My absolute favorite thing from the meet was seeing all of this potential and wondering who, out of all of these talented ladies, will climb to the top of the ranks two years from now. August 6, 2014 in 2014 Secret U.S. Classic, Abby Paulson, Abigail Matthews, Adeline Kenlin, Adriana Popp, Alyona Shchennikova, Anastasia Webb, Aria Brusch, Bailey Ferrer, Caitlin Smith, Christina Desiderio, Deanne Soza, Delanie Harkness, Elena Arenas, Emily Gaskins, Hannah Joyner, Jazmyn Foberg, Jordan Chiles, Kailey Gillings, Lauren Navarro, Lexy Ramler, Maggie Musselman, Maile O'Keefe, Makenzie Sedlacek, Margzetta Frazier, Marissa Oakley, McKenna Appleton, Megan Freed, Megan Skaggs, Morgan Hurd, Nia Dennis, Norah Flatley, Olivia Dunne, Olivia Trautman, Rachael Flam, Rachel Baumann, Ragan Smith, Shania Adams, Shilese Jones, Sydney Johnson-Scharpf, Taylor Lawson, Victoria Nguyen. 2014 Secret U.S. Classic: Who Made it to P&Gs? I thought Marissa Oakley’s double double off bars was noteworthy. I mentioned it! and posted a video of it in the junior video post, which is linked to this post. I ALSO mentioned it on GymCastic. Looking back at qualifier meet scores, Poor McKenna Appleton was 0.05 from qualifying straight to P&G Championships at the last National Qualifier and 0.15 away at the American Classic, then those falls on beam at US Classics (despite the awesome mount, I agree!) killed her beam score (5.6 E, poor girl) and her last chance at qualifying. Thanks for this article! This is why I absolutely love watching the juniors: the focus is on the gymnastics and the skills themselves, not so much on the “it girl,” the image, who is going to make what team… just a lot of gymnastics and whole lot of potential.